Are you current on your AML training and audit? 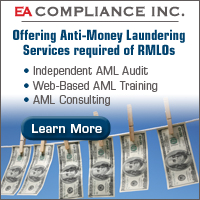 Anti-Money Laundering training is an on-going requirement! For $25, you are able to take this comprehensive training to be compliant! This is a on-going training so you may take the class at any time! 2. Click on "Take New Course" (on the top gray menu bar). 3. The registration process will begin. You will be asked to supply information necessary for reporting to your firm's compliance director and proving your participation to appropriate regulatory bodies. Upon completion a confirmation email will be sent immediately to the email address you enter. A letter confirming your satisfactory completion will be mailed to your compliance director (if applicable) approximately one week after you finish the program. During this process you will be asked to create a User Name and Password. The User Name must be at least five characters and the Password must be a minimum of eight characters. The purpose of the User ID and password is to allow you to start and stop the program as often as desired and to then allow you to re-enter the course starting from where you left off. 4. When you have entered all your registration information, you may be prompted to select which course you want. Please click on Anti-Money Laundering Training for Residential Mortgage Lenders and Originators. 5. You will be asked to enter a credit card payment for $25.00. This is a fully secure ecommerce website. Alternatively you may call Exchange Analytics directly to provide a credit card number over the phone and obtain an access code. 6. The AML training course should begin. If for any reason you have any problems with access, please call Exchange Analytics at: 800-823-8442 or email us at: exch@xanalytics.com. 7. Upon completion of the tutorial, Exchange Analytics will receive immediate notification and report your completion to your firm. If you enter your email address properly you will receive an email confirmation immediately as well. Please Note: If you would like to quit the program at any time, or accidentally get disconnected from your Internet Service Provider, you may re-enter the program at the same place you left off. Simply click on "Re-Enter Course" (on the top gray menu bar) and then supply your User ID and password. If you have not yet finished the course, you will see a link to the course in progress. Please click that link and you will start where you left off. If for any reason you lose your User ID and password there is a procedure available to help you get it. If your program starts to slow down, clicking on the refresh button may improve operation. Otherwise, the problem may be caused by heavy Internet traffic or a poor Internet connection. If that is the case, it might be preferable to exit the program and return at a later time.